After the Heat, We Battle for the Heart is a play divided. With a split narrative, duelling lead characters and even a split audience, it bristles with conflict. 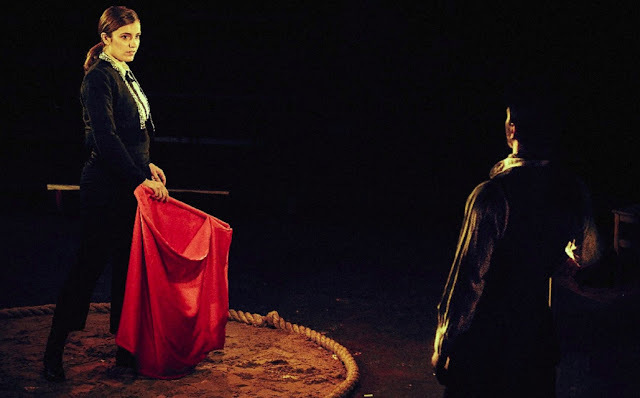 The central motif is bullfighting; playwright Tallulah Brown approaching it as a metaphor for female liberation, a battle with self-doubt and of cultural inheritance. 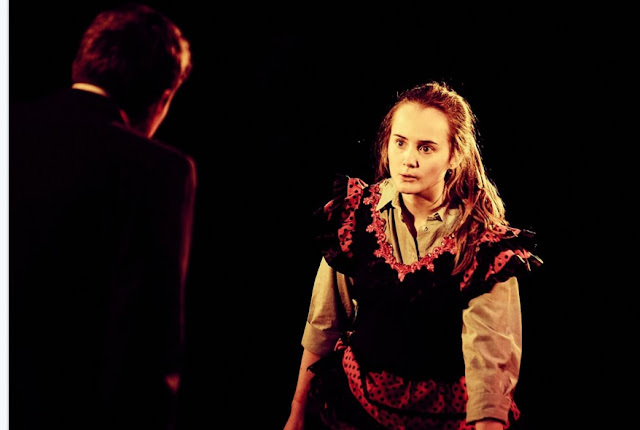 In contemporary London, Ruth (Jennie Eggleton) is miserable. She's just been sacked, her boyfriend (Josh Taylor) is exasperated, she's starved of attention and, to cap things off, her grandmother is at death's door. Perhaps it's no surprise that she ends up perched on a window sill, contemplating ending it all. Meanwhile, in 1940s Spain, Peruvian matador Conchita Cintrón (Paula Rodriguez) prepares to face her 750th bull. But in Franco's Spain women are banned from bullfighting on foot. Conchita refuses to be told what to do, squaring up to this sexist law to the consternation of her manager Ruy (Fed Zanni), who fears political and physical reprisals. After the Heat... seeks to reconcile these two very different characters; showing us how the bravado of a past heroine can affect a modern woman. Unfortunately, these two halves don't gel that well: the result is a play that first baffles and eventually bores. Simply, the whole thing is cripplingly underwritten. Ruth is the emotional prism through whom the play is refracted, but we're given little reason to care about her. The main flaw is an internal monologue that explains explicitly who Ruth is, rather than allowing us to infer it ourselves through Eggleton's performance. It's a classic case of telling rather than showing. Meanwhile, the bullfighting narrative is mired in cheesy melodrama. Both Conchita and Ruy feel like characters from a cheesy soap opera and the backdrop of fascist Spain is poorly conveyed. For example, Ruy warns Conchita that she should be careful as the crowd is full of "francophiles". Unless this bullfighting audience has a particular passion for baguettes and berets, I'm pretty sure they mean "Francoists". Perhaps that's just an unfortunate slip-up, but it's symptomatic of a script that really could have used a couple more drafts, if not a top-to-bottom reworking. It's not that the central conceit of bullfighting as psychological metaphor isn't fertile soil (there's the classic Freudian interpretation of bull as id, bullfighter as ego and audience as superego), but After the Heat...'s feminist analysis works only in the broadest "believe in yourself" cod-inspirational kind of way. I can't really blame the performers for this. I saw Only Forever so I know Jennie Eggleton is a top-notch actor. Both she and Paula Rodriguez are excellent when we focus on body language and the two can conveying genuine emotion through poise and dance. It's in these dialogue-free moments that we finally get an unvarnished glimpse at the characters. Then they start talking again and things collapse into a formless goopy mess. As the curtain fell I genuinely couldn't work out what the point was. In an effort to understand, I read up on Conchita Cintrón and found the exciting and genuinely moving story of a woman bravely standing up to a institutionally misogynist dictatorship. But when a Wikipedia page is more moving than a play, something has gone awry. 'After the Heart, We Battle for the Heart' is at Vault Festival, until 28th February 2016. Tickets here.